Black History is part of the common record of humanity. It proves that people of African heritage have made enduring contributions to society throughout history. Classical music has been enriched by such contributions as long as it has existed. 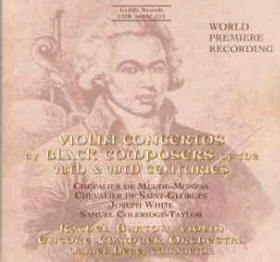 This page includes a link to a Black History Quiz comprised of 52 questions about composers and musicians of African descent. The Composers page leads to 41 individual biographies of composers. The Musicians page leads to 11 profiles on conductors and instrumentalists. Over 100 sound samples can be heard on the Audio page and at the pages of individual artists. For purposes of this site, African Americans are considered to be people of African descent who are born anywhere in the Americas. People born in Europe of African descent are called Afro-Europeans. Listen to audio of an 8-minute interview (mp3) from December 28, 2005: "WDET'S Craig Fahle recently spoke with Bill Zick, Webmaster for www.africlassical.com. His website has become one of the premiere resources for those interested in Black composers of Classical Music"
In 1987 the African American conductor Paul Freeman became Founding Musical Director of the Chicago Sinfonietta, an unusually inclusive orchestra whose mission is "Musical Excellence Through Diversity". Its Web site is: http://ChicagoSinfonietta.org Dr. Freeman served with distinction for 24 years. He handed the baton to his successor, Mei-Ann Chen in May, 2011. Maestro Freeman is profiled among the Musicians of African Descent, as is violinist Aaron P. Dworkin. He founded the Sphinx Organization to introduce Black and Latino string players to classical music and the classical music profession. Its principal Web site is www.SphinxMusic.org The group also operates an interactive educational site for children at www.SphinxKids.org The Sphinx Virtuosi (formerly the Sphinx Chamber Orchestra), the Harlem Quartet and the Catalyst Quartet make a performance tour of the United States each October. Henry: A Ballad for Piano Quintet, was composed by George Augustus Polgreen Bridgetower and arranged for piano quintet by Prof. Dominique-René de Lerma. It has been returned from the former MMB Music of St. Louis, and will now be issued by Casa Musicale de Lerma. Departmental Archives of Guadeloupe. Le Fleuret et l'Archet : Le Chevalier de Saint-George, Crèole dans le Siècle des Lumières [Foil & Bow: Chevalier de Saint-Georges, Creole in the Century of the Enlightenment]. Bisdary - Gourbeyre, 2001. Heddle-Roboth, Robert and Marciano, Daniel. De L'Epée à La Scène: A Book on Theatrical Fencing. Preface: Marcel Marceau. France: Thespis, 2005. King, Reyahn et al. Ignatius Sancho: An African Man of Letters. London: National Portrait Gallery, 1997.